At Easter I made paper egg ornaments to go on my Easter Egg tree. They were easy and turned out pretty cute; so for fall I thought why not make pumpkins! This craft is great for kids but works well as an “adult” craft for decor as well. Here’s how I made them! Step 1: Collect orange scrapbook paper in various patterns. If you’re doing this as a kids’ craft, construction paper is a good material as well. I used pipe cleaners for the stems and double sided scrapbook tape as an adhesive. Step 2: Trace circle on the non-pattern side of the paper. I wanted my pumpkins to be two different sizes, so I traced two sizes of circles (thank you Ikea children’s dishes!) onto the back of my paper. I was able to fit 2 small circles and one large on each sheet of paper. Step 3: Cut out circles. 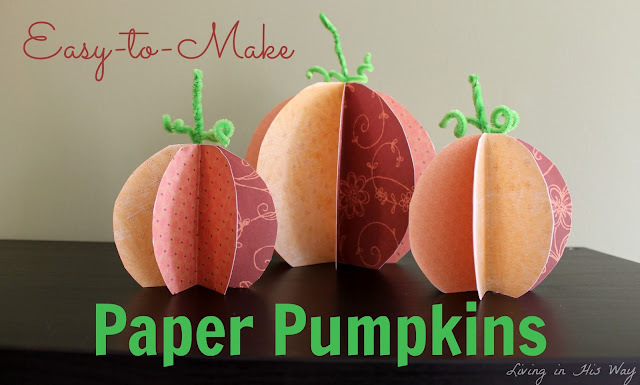 I used 7 paper circles to make each pumpkin, but these pumpkins can be made with as little as 3 or 4 circles, or even more! Step 5: Attach the circles together one by one, using the double sided tape. Be careful NOT to attach the first and last halves together prior to completing step 6. I prefer double sided tape for paper crafts because it’s not messy and it’s super sticky, but my toddler helped me using a glue stick, and it worked well too! Step 6: Twist 2 green pipe cleaners together to make the stem. Twirl a third piece around your finger and attach to the first piece making a ’t’ shape. Step 7: Insert the pipe cleaner stem before attaching the last 2 halves together. Step 8: Use scissors to trim up the edges where white is showing and cut the bottom off of each pumpkin so they stand up. And voila! 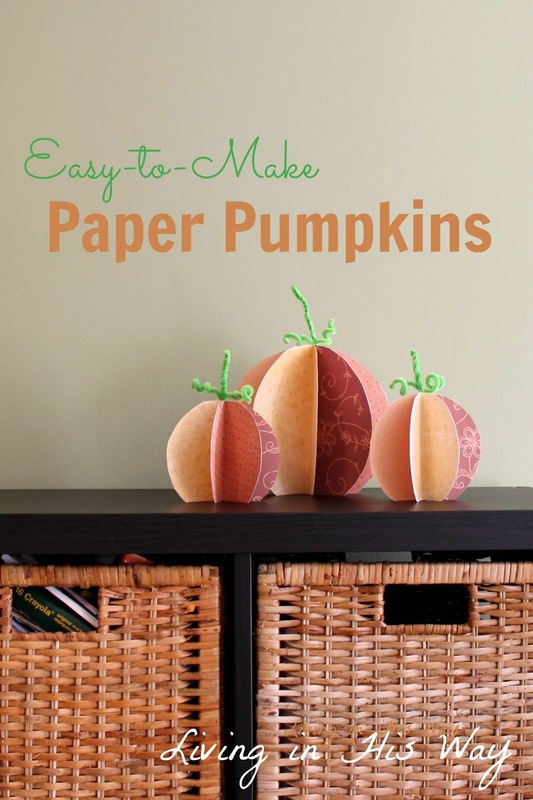 Cute and easy paper pumpkins! This post may contain affiliate links. See our disclosure policy for more information. Jennifer is a teacher who traded lesson planning for full time motherhood and is now busy learning and creating with her two young children. Currently in the process of designing her third home in four years, she loves a good DIY project. Crafting and party planning - and searching for craft and party ideas on Pinterest - are among her favourite things. Jennifer lives in the Greater Toronto area and you can keep up with her and her latest projects at Living in His Way.